I would like to inform you that we have done a thorough market survey. After this survey, we mapped out the details of our project. We were pleased to find that even after leaving an error margin, we were able to stay within the budget, that is [eg: $20, 000/-]. Kindly check the proposal and quotation and reply with any additions. For any queries, contact us on [TEXT] or on [TEXT]. Looking forward to working with you. 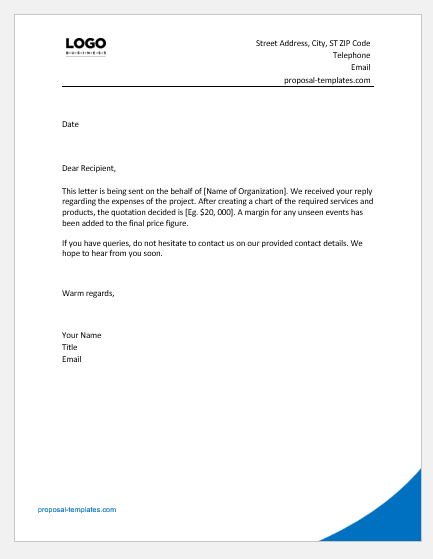 This letter is being sent on behalf of [Name of Organization]. We received your reply regarding the expenses of the project. After creating a chart of the required services and products, the quotation decided is [eg. $20, 000/-]. A margin for any unseen events has been added to the final price figure. If you have queries, do not hesitate to contact us on our provided contact details. We hope to hear from you soon. Our concerned department has been working on estimating the expenses that will be required for the project. According to the products and services as well as the overhead charges, the quotation price has been set on [Number]. This sum also includes a margin for any errors made during the calculation. 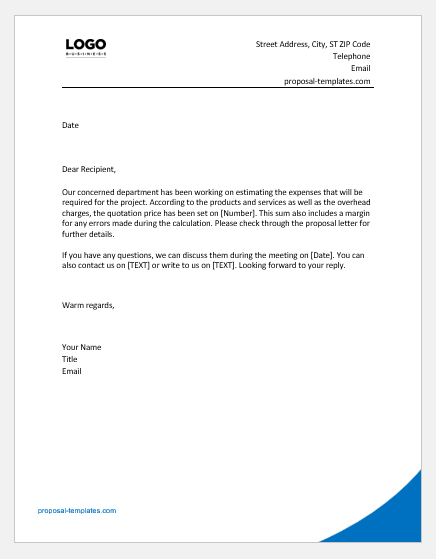 Please check through the proposal letter for further details. If you have any questions, we can discuss them during the meeting on [Date]. You can also contact us on [TEXT] or write to us on [TEXT]. Looking forward to your reply. 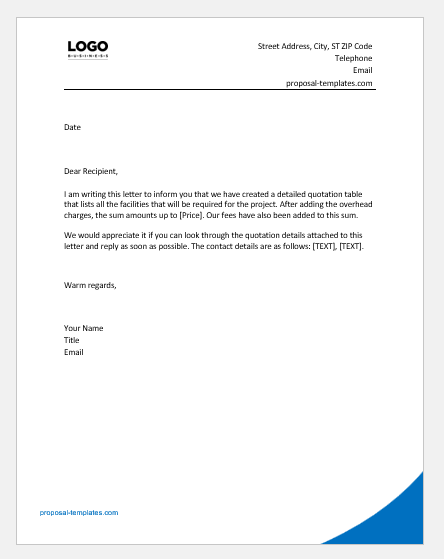 I am writing this letter to inform you that we have created a detailed quotation table that lists all the facilities that will be required for the project. After adding the overhead charges, the sum amounts up to [Price]. Our fees have also been added to this sum. We would appreciate it if you can look through the quotation details attached to this letter and reply as soon as possible. The contact details are as follows: [TEXT], [TEXT]. 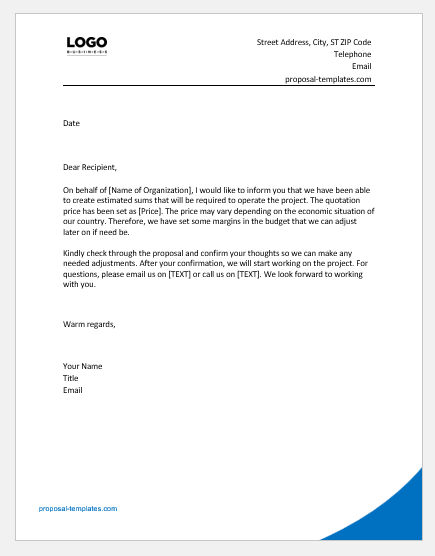 On behalf of [Name of Organization], I would like to inform you that we have been able to create estimated sums that will be required in order to operate the project. The quotation price has been set as [Price]. The price may vary depending on the economic situation of our country. Therefore, we have set some margins in the budget that we can adjust later on if need be. Kindly check through the proposal and confirm your thoughts so we can make any needed adjustments. After your confirmation, we will start working on the project. For questions, please email us on [TEXT] or call us on [TEXT]. We look forward to working with you.